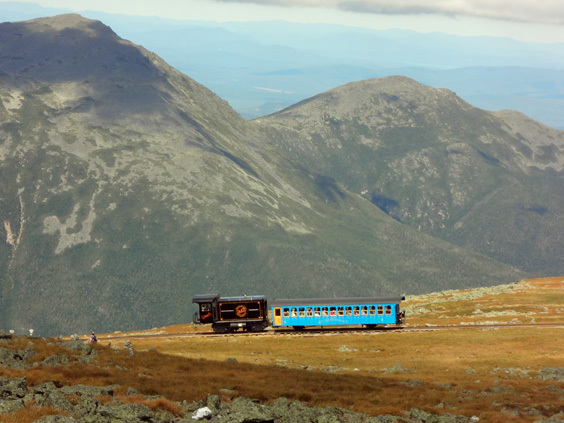 252 responses to Images tagged "cog-railway"
What beautiful photos (for the most part)! 🙂 This kind of makes me want to get in to hiking. Nah, nevermind. I enjoyed my nap today. Congrats on getting started! Hope Day 2 was easier. Excited to read about the rest of your journey!!! Love it Darren, Just keep reminding yourself that after tomorrow it will get easier…..
Great so far Daren. You should have brought Fran to carry your pack, and Brad looks so happy knowing there are only 3 weeks ahead ! Have fun you two….so excited for you both..what a great time and great memories as brothers. Looking forward to seeing and hearing all about the rest of your trip..on face-book. 1)La mejor correcciÃ³n para esas novelas horribles que mencionas arriba, margaret, es no editarlas. Hay mucho que releer para que se inunde el mercado con tÃ­tulos prescindibles, aunque, claro, de eso se trata, de mercado y no de ‘gestionar’ buena literatura 2) Yo sÃ­ estoy de acuerdo con al distinciÃ³n de Jonas entre editar o hacer editing con best sellers y obras, digamos, autoexigidas. Â·)Finalmente Â¿por quÃ© despierta tantos odios Olmos? Reminds me of Turkish commando team are going to Palestine to get revenge of the aid workers who were killed by israeli commandos in the Flotilla bound to Gaza. They go on to hunt for the Israeli-zionist military commander responsible for the Gaza flotilla raid. Hi Chuck, if the facts are as straightforward as you present them, you should contact a lawyer. Depending on where you live, there may be a legal advice service in your area that will provide you with some free advice and/or access to a copyright lawyer at lower fees. Hey guys looks like your having fun. Enjoy the rest of your trip. Looking forward to seeing/hearing more about it. Hey you guys look good! And Oh by the way the beer and lobster I had last night was really great. Wish you were here, he he he ! Talked with Fran and Wyatt last night. Whew, you guys need a shower. So now you know why those crazy people run on the mountains. They are practicing for when there is a thunderstorm so they don’t get stuck at the top with lightning and rain. By the way, our quote of the day was from Russ when he saw a pic of your brother and said, “So I guess we know what Daren would look like with a beard”. Sounds like you’re having a great time. Stay safe! Great description. I wanted to go before reading it, now I REALLY want to go. Need to find a babysitter and free time. D’oh! Well you guys are doing a good job so far. We toasted you last night at the Puritan Restaurant with a Sam Adams ! Fran bought you a new Stove to cook on once you get home. take care and be safe. Hey there Scottie – glad to hear you guys are doing well so far and made it through the thunder storms. Sorry you’re losing 7-6 and tripping is out of the question since it counts against you. But if a branch were strategically placed in a trippable manner, does that count against you? I’d think about that one… and i’m surprized you didn’t use the names of Frodo and Gollum. You are bigger fans of that movie and Brad could do the Gollum voice and it’d be a very interesting trip (not that it hasn’t been already). 🙂 Enjoying the posts and pics and have fun guys and be careful! Since you need to stay at the “top of your game” you and Brad stayed away from the Brewery, Right ? Right !!!!!!!!!!!!!!!!!!!! So have a great time this week and be careful you guys. / I keep listening to the reports talk about receiving free online grant applications so I have been looking around for the finest site to get one. Could you tell me please, where could i find some? Love your presentation,ï»¿ I’m gonna try it tomorrow. One question – Am I supposed to release my breath inside water? Because I find the time my head comes out the water insufficient to release and take a breath!! I had been wondering if you ever considered modifying the layout of your website? It is well written; I love what you have got to say. But maybe you can add a a bit more in the way of content so people might connect to it better. Youve got a great deal of wording for only having one or two pictures. Maybe you can space it out better? We knew all along you were “Half-Crocked” nothing new here. It shows your young age if this is the first time you have heard of a “Privy”. Your Mom is going to KILL you (if a bear doesn’t first). Glad to see your time on the trail hasn’t effected your sense of humor. Sorry to hear about the Croc. I know how close you had gotten. Thank you! Wilderness hiking blogs need more references to AirWolf and any other super secret experimental helicopters. Chongae is helping your Mom put extra Ex-Lax in your next batch of Brownies !!! Brad looks more like the Incredible Hulk than Walker Texas Ranger. This is Uncle Bruce telling me what to type to ya. (He”s not a typer.) I was in monson on wednesday . I went to Blanchard. If I only knew I could of given you both a ride , chat or five hour engery drink. Sounds a great trip thanks for the up date. Great blog, Daren, I’ve enjoyed reading it between my multiple daily naps. Can’t wait to get out there and finish up the daunting final 100 miles. Good luck on the final leg of the trip. Tell Pierre I said hello! My buddy and I had been just talking over this article, she is normally endeavouring to prove me completely wrong! I will show her this post and rub it in a little! Daren dear, the batch of brownies is coming along very well…. Can’t wait to see you guys again! Wish I was young and in shape enough to do what you guys are doing, I might even join you! Relax – I’m not in shape. Am in the area for the week and this hike was suggested to me as a good ambitious one to do where I could start and end at my car! I was thinking that it would be better to do ‘not alone’, and was wondering if there is a place to find one or two others to go with on Friday (weather looks promising). Is there such a thing?? lol…thanks for whatever you can share. Looks like you had a good time. China is definitely one of those places I would like to go but I think I’d want a guide. I’m not sure I’d enjoy the travel time too much, but I am pretty adept now at functioning on very little sleep. Good analogy. Jet leg is very much like living with an infant. Well I guess the secret is out Daren, the only original thing missing are the original owners Harland and Mildred Hussey. They were real Maine entrepreneur’s ! He Deer hunts in the same outfit ! Just did this loop this past weekend. Looks like you had some awesome weather on your hike! I was not that lucky. haha. Great page! Thanks, Jona. Yes, the site is run on WordPress. The theme is “Canvas” from Woo Themes. The background dirt and logo I did myself. It maxed out my lack of design skills. Great review! Many thanks for realistic advices! We arrived to the parking lot at 12:50 p.m. (slightly after noon you’d say?) and decided to do only half of the loop (stopping at mount Lincoln). We barely made it – took us 6:25 for easier part of the loop I’d say. Great advice not to start full loop after noon. Provided the above information, I have discovered many valuable suggestions to help me in my upcoming plans. Thank you for taking the energy to develop this blog site content. Nice photo’s Daren, and a nice picture of the cool clear water you bye-passed. Enjoy the hikes ans scenery. Good reading Daren, and the photo’s are fantastic.Can’t imagine being up there in a Thunder or snow storm ! The new shelter looks nice! Wish I’d taken a photo. Very thorough and detailed report! Thank you! Heading up there tomorrow..
keep an eye out for Lyme Disease. Some of the symptoms you described are commonly associated with it. The northeast is chock-full of Lyme carrying ticks, especially this “year without a winter.” Iron Mike ended up with it after we hiked with you and Brad in ME. Oddly, I think it might have been caused by the ready-mix Propel I was adding to my water. I started getting sick again on another hike, and once I switched back to regular water I started feeling better. Thank you so much for this site. It’s an incredible help as we plan our hike and future plans for BSP. Congrats on the summit! You’re very welcome. Good luck on your hike. Please share some photos with us after on Twitter or Facebook. Thanks for this post! I have been thinking about this winter hike for a while now. Planning on staying at the lean-to and hitting the peaks for sunrise and/or sunset. You’re very welcome. Love the idea of a sunrise/sunset hike on Baldpate. If you do it, please share photos with us on Twitter or Facebook. Great post. Unfortunately, most retailers don’t stock a very good selection of hiking boots so you often have to go online to buy something. It’s a real problem. Good point. Store shopping is especially tricky this time of year when retailers are between trying to unload last year’s models and rolling out the new boots for this summer. A recent trip into EMS had me on my third request before I even found something in my size, and I’m in the average size range. I like bright colors because I just do, but I’ve always realized that bright colors for climbing gear had a visibility function. That being said, check the price tags on brightly-colored gear vs. gear in earth colors. The bright stuff is always more $$$. What a glorious day! I can’t get over how blue the sky was. I’d love to go on a snowy hike in the Presidentials some day. It’s awesome, Mike. Put it on the bucket list! If you choose the right outdoor clothes, then definitely outdoor clothes will keep you safe. If you make the right choices in the way you dress, it will dramatically impact your level of safety and comfort. Outdoor clothing aims to protect you both against the weather and to keep you dry and comfortable. You’ve done it now, Daren! I want to reach the summit of Katahdin even more now than ever before. Great post – loved the history and folklore about the mountain. Thanks Lorne, glad you found it helpful! I did it on July 2. It is an exhausting climb to the top. Took almost exactly 4 hrs as predicted. Yes, I am older & slower, but do not underestimate this climb. Hard work. I was delighted to take the hiker shuttle bus back down. Great experience. There’s no way to get down from Helon Taylor Trail without doing the Knife Edge or Dudley? There’s no easy on the knees way down? Can one go up Helon Taylor and return down the same trail or would that be too difficult? It’s Katahdin, with tons of rocks and steep elevation gains, so any route will be felt in the knees if you are prone to knee issues. The Saddle Trail is considered the “easiest” trail, but from Helon Taylor you have to cross the Knife Edge to get there. If you go up Helon Taylor, returning via that trail or the Dudley Trail are the only options without braving the Knife Edge. Helon Taylor is a trail you could use trekking poles on to take pressure off your knees. Just pack the poles away if you try going though the Knife Edge chimney. Good luck! I such as the useful info you offer inside of your content.I will bookmark your weblog and examine all over again right here often.I am relatively guaranteed I’ll gain knowledge of a lot of recent stuff appropriate listed here! Decent luck to the following! … 2/26/2007 2:45 odp.4. StydÃ­m se za ÄlovÄ›ka, kterÃ½ nemÃ¡ vyÅ™eÅ¡enÃ½ svÅ¯j vlastnÃ­ Å¾ivot. DÃ¡vÃ¡ tÃ­m najevo opovrÅ¾enÃ­ lidmi, pro kterÃ© sluÅ¡nost, morÃ¡lka, vÄ›rnost, pravdomluvnost nejsou prÃ¡zdnÃ© pojmy.PromiÅˆte ale nikde tu nemohu takovÃ½ pÅ™Ã­spÄ›vek najÃ­t. Na koho reagujete? Jacqlyn Smith,I believe you are correct.If they had to cough up the Kenyan birth certificate, Obama would go to prison.That would definitely be an embarrassment to Mr.Obama, his family, and the fourth of the Nation that voted him into office. Ah, si eu ma plangeam ca ma bat aproape toate incaltarile. Se pare ca se poate mai rau 🙁 Incerc sa-mi iau tenisi/sandale din panza, parca se adapteaza mai usor formei piciorului meu. Adela, ai incercat sa-ti faci pantofi pe comanda? Ca sa fie exact marimea ta. Eu am unii pentru dans, nu m-au batut deloc deloc. Singura problema e atunci cand stau mai mult cu ei si mi se umfla picioarele, atunci ma cam strang. Dar cred ca o sa se "muleze" intr-un final. I am sooo disappointed with the changes of letting Eric Wilson and Jacqueline London go. I have been hoping and praying that they would come back. I loved my morning news and looked forward to waking up to both Erik and Eric. There is no way that I would ever believe that this is what the viewers wanted is to get rid of two great people . I am with the viewers that will be looking at other news channels now. And if channel 6 really wants to get rid of someone, please get rid of Ping! This guy is very annoying and should not be on TV, much less the daily news! I agree with Larry, even though I had trained for the climb, I found it difficult. Two years later, I can’t wait to try it again. Please note, however, if you don’t want to climb down, you can take the van shuttle. It cost $30.00 and takes about a half hour. By the way, this report was as accurate as it gets. Where was that last picture taken? Amazing view! You’re testing my memory, Mazz. It’s in the 100-Mile Wilderness, but I don’t remember exactly where. Possibly a ledge near the beginning of the Barren Chairback Range. that was taken on barren ledge, you are looking at lake onawa and borestone mountain. borestone is 11 miles outside monson and is an awesome day hike, barren ledge is also doable as a day hike. Great essay. I guess I’m an intermediate hiker (two sections of the AT under my belt, one section in the Cascades). I’m doing the Whites in a few weeks for the first time. Just a few questions: how much weight does each of your dogs carry? Is it all food, or do they also carry their own water? (how much water total do you take?). Do they need training to do, say, a 15-mile daily hike? Hey, Sheba and I thank you! For two dogs (50 and 63 pounds) who drink from natural sources (watch out for giardia! ), I carry about 1-1.5L for a 9 mile hike this time of year but increase that in the summer and/or choose hikes that pass multiple water sources. Ty carries water but never food. I get a little paranoid about her carrying items with scent to them. A 15 miler should be built up to but the amount of training depends on the dog, what level and type of exercise she is accustomed to doing regularly, and the terrain of the planned hike. A big reminder I always give, and sorry if it is old news, is not to forget about her pads. For example, a dog who does most of her exercise on dirt or grass may have a tough time trekking over rocks for hours! Happy Trails to you and Sheba! Thanks Krista… yep, pads are a concern. Sheba and I do 2-mile runs on the sidewalk. She’s had a couple sores break out, but normally she’s ok. On rocky trails, though, it might be a problem. Anyway, I’ll store away your advice for a possible future hike with her. Thanks again! My pleasure! Sounds like she’ll have the interest and stamina for a shorter hike to start but will love the double digits once she builds up to them. Have fun! Using the criteria outlined, what would be your list? nice description of what appears to have been a great great hike. Thanks!! Do you have a map of the route you took?? Happy trails!! Thanks, Mark. I don’t have an online map plotting my route. For the hike, I used the AMC’s White Mountain Trail Map #5 for Carter Range – Evans Notch. With a good map, there’s a ton of variations on this hike that could be done. Enjoyed your article and pictures. I must admit, I enjoy the challenge of “ledges” and/or bouldering or climbing where aids are not needed. Any ideas of a 3 day hike in Maine that is easier (I know, it’s Maine, not very easy), because my mom REALLY wants to go on a hike with me, but she’s a heart patient. She can get along alright as long as it’s not a lot of major elevation gain. Hi Christine. I’d suggest the stretch from East Flagstaff Road/Bog Brook Road (after Bigelow) to Caratunk. 20 miles, 2 shelters, 2 ponds, nothing over 2,000 feet. Caratunk to Monson also not too bad, though there are two mountains with short but steep sections (this would be 38 miles). Another possibility would be to hook onto the 100-mile wilderness anywhere after White Cap Mountain. Just don’t overlook Nesuntabunt Mtn., it’s really short, but also steep. Thank you so much for taking the time to get back to me. On the way to Mt. Garfield you take rt 93 (not 95). Just wanted to let you know so your followers don’t end up in Maine! Great catch. That would explain all the angry e-mails. Thanks for pointing it out! A great read! I’ve been looking into this hike for a bit now. I think I’ll do it in 2 or 3 days. This was a great hike. Not too difficult but the views were fantastic. Thank you so much for having this overview! I found it to be extremely helpful in planning my trip this coming Labor Day! Any comments on the weather at the top of the mountain during this time of year? Your welcome, Christi. Thanks for checking out the site. Good luck on the mountain. Weather advice? Be prepared for anything! gOSTEI DA NOVIDADE, E DA FORMA DE ESCLARECIMENTO AO CONSUMIDOR,QUE VÃŠ COMO UMA OPORTUNIDADE DE VIAJAR MAIS VEZES EM VÃRIOS MOMENTOS DE SUA VIDA QUE NÃƒO SÃ“ EM FÃ‰RIAS PROGRAMADAS. Wonderful exatnpalion of facts available here. Awesome job here. I love the humor and the detail really helped build confidence for this hike. I’m headed out this weekend and will repost upon my return. Thanks! Thanks Tyler. Good luck this weekend! Please share your photos with us on Facebook, Twitter or Instagram. Thank you for sharing! I’m not ready to try it myself, but maybe someday! After camping at Avery Peak, did you and your son take the Fire Wardens Trail back down from Bigelow Col, or did you take the AT Horns Pond Trail Loup down? Did you come down the same way you went up? I was wondering, if you did in fact descend directly down from Bigelow Col on Fire Warden’s Trail, was the 0.7 mile steep rock staircase hard to descend? My question is: Is it possible to just go straight up Fire Wardens Trail to Avery Peak, and then at Bigelow Col, return straight down Fire Warden’s trail? Do day hikers do that? Is the trail marked clearly for the trip down that way? I’d like to just go up and down the Fire Warden’s Trail, and not take the Loup, but was concerned about going back down the 0.7 mile of steep spiral rock staircase. Is that what you and your son did? Yes, you can go up and down on the Firewarden’s Trail. It’s steep on the upper part, but mostly all rock steps and no ledges or anything like that. No worse than any of the other descents. Thank you so much Daren! Good catch, thanks for pointing it out! simple elegance from head to toe.Thank you for creating AS. When things get a bit to much around here I link up with your blog to wonder what are the Advanced ladies in New York (Paris) up to. It always brings a smile. This understated style suits me in particular. Never unrteestimade the power of the perfect coat. Completely agree. Holden is much better than Torres, Edu, Beckerman, etc. Hopefully he can get, and stay, healthy. My “all healthy” A team would be:————————- Altidore ————————————– Donovan —– Dempsey ————–————– Bradley ——— Holden —————————————– Jones ————————–F.Johnson —– Boca — Gooch —– Chandler————————- Howard ————————Of course, this is hoping Chandler picks us. He is much better than any other RB’s not named Dolo. Definitely not too shabby. You guys rock! Fran may kill you for the ring pic though. Well at least you called it the precious. You make me want to put on my hiking boots and hike a mountain. Well, maybe my sneakers and go for a walk. They say soaking in a tub with epsom salts helps the soreness but you orobably already know that. What could go wrong with taking your ring off on a rocky mountaintop? Hiked up the Bridle path on Sept 11th…. initial plan was to do the whole deal.. Franconia Ridge. It started raining. It started pouring. Hooked up with a great guy fromOhio and we made it to Greenleaf, full of hikers trying to dry off. The lightning when we were fully exposed to the ledges was nerve racking. I stayed at the hut for an hour and the weather finally settled. Wasn’t crazy enough to attempt the ridge with 60 mile and hour winds. Came back down Bridle path and the sun came out. Excellent views. One quarter of the way down an emergency helicopter went over my head. I hope it wasn’t my buddy! Will come back to attempt the whole Franconia Ridge, but will make sure the weather is my friend. Where do we find the overall results of the AT in a day? I did GA portion. Great write up and spot on comments about the Falling Waters Trail. I have read too many accident reports about FW trail claiming victims slipping on those rocks. I did this trail a year ago and was amazed at how the mist reached so far onto the trail making those ledges very slippery. I want to hike up Bridal as far as Walkers Ravine. I heard it’s 1.9 miles. How will I know when I am there? Is it the first view point? I will then turn around and go back down. I don’t want to get ALMOST THERE then turn around too soon. Any ideas from you experienced hikers? I want to point out departure should be plenty early, so you don’t run out of daylight coming down. I left a little late and almost ended up in the waterfall. Leave yourself a little extra time to get down those slick blocks of wood!! This hike was the biggest learning lesson of my hiking life so far. Preparation. We intended for it to be a day hike but started out way too late in the day. We had no idea what the trail looked like and I left all the planning up to him so I didn’t study the length, elevation climb, etc. Long story short, we ended up at the top of Little Haystack as the sun was going down. I hadn’t eaten or drank enough and my body started letting me know how upset it was. We missed our turn off for Old Bridle and it was so dark, we had no lights, so we just started cruising down the side of the mountain until it was too dark to go further. Pulled up a rock and waited for the sun to rise. Wow. Amazing article. I was planning to hike this mountain in Mid January. Is it safe for beginners ? I simply want to say I’m newbie to blogging and truly savored this web page. More than likely Iâ€™m planning to bookmark your blog post . You really have great articles and reviews. Thanks a lot for sharing with us your blog site. Please don’t judge me for this question… at any point in this hike did you find yourself dangerously skirting the edge of a very long drop? (I would love to hike up with some friends this summer but taking the auto road last summer was sheer terror & now I’m gun-shy). Laura, it’s steep but safe if you stay on the trail. Freelancing off trail can put you in serious danger of being near a cliff. Andy,That is awesome. Your newest shots are some of your best!That is cool how things got started for you way back in Houston. Here is to many more years to come for you gallery!! Hey dude, awsome review. I’m thinking about going up to this mountain this weekend. bringing someone along with me that might not be as comfortable as me on the moutnains. any chance you can give me a bit more detail on the alternative rount you took up the Chimney? Did the Helon Taylor Trail last year and the trail up was rugged but this is my 61 year old body talking. We also descended by the same route which I didn’t find terribly difficult and the rock formations (which I didn’t notice on the way up) were spectacular. The toughest part was the texture of the rocks. My legs looked pretty beat up at the end. All said the hike was totally worth it. I’ve seen Knife’s Edge from Baxter Peak so this was a way different perspective and it was worth the trip. Good information, planning a hike of the Whites and Washington later this year..
did this on saturday, it was labeled as an “intermediate” hike by the hike organizer. I have been hiking for over ten years, novice, intermediate and advanced summits. This was no intermediate hike. The descent was treacherous. I wouldnt recommend this to anyone who doesnt have crampons and axe or experience. Hello! I have a NH AT question. Many years ago my friend and I went out to backpack the Mahoosuc Range from Gorham starting on the Centennial Trail at the end of May. Were we in for a weather treat we weren’t prepared for! Pouring rain, low clouds and visibility. I thought it was the first real peak we hit that had a rock slide to the top – am I remembering wrong? Or was that Success? I think it was before we reached Carlo Col. There were no views at all or I’d have a better memory of it. Hi Jim. I don’t recall any rock slides. Success is open granite on the S to N approach, and there are some steep ledges coming down the opposite side, as well as a steep rock scramble into the col before Carlo. Does that help? except this blog offers quality based writing. Sur le forum, j’ai quand mÃªme lu des mecs qui avec 2 grand chelem de plus, cad 8, considÃ©reraient Nadal comme le GOAT, je sais pas trop comment mais bon, c’est te dire. Globalement y a plus de pro Federer, des mecs qu’on rÃ©flÃ©chit un peu plus que savoir si Nadal en a une plus grosse, qui s’exprime.Hier Ã§a faisait mal, voir plus de soutien pour Ferrer -Simon Ã cÃ´tÃ© c’est McEnroe- que pour Federer. Love the photography work that came with your hike review. Finding a good winter hike can definitely be a little bit of a task. Out of curiosity I’m seeing the comment about this being above an intermediate hike, are there any particular winter hikes you would recommend for beginners who are relatively new to the area but are still worth doing? Curious where you would point to someone just starting out. Thanks! Awesome! Thanks for the quick response I’ll definitely be checking this one out for my next area winter hike! Last did the complete loop in 1983 (yes–I’m old) and have done the Falling Waters–Bridle Path loop many times since. I remember the Garfield Ridge between the Garfield shelter and Lafayette is pretty rough. In your opinion is it one direction easier than the other. Pretty much a coin flip, but going from Lafayette to Garfield would be my vote for slightly less tough because I’d rather go up Lafayette than down it. Best blog about a hike I’ve seen. Thank you – it was extremely informational. There are rules governing where you can camp in the WMNF. You should look them up. You don’t need any sort of permit to hike or camp so long as you follow those rules (obviously you’d need reservations to stay at any of the huts). Great write up, thanks! We have done 12 of the ADK 46 with more coming and plan to tackle Mt Washington this summer. We’ll let you know how we do. Not an experienced hiker? Do you “think” you are…Please take the time to read my review. Our family is active and loves adventure especially a great hike. We wanted to really challenge ourselves so tried hiking the whole loop starting with waterfalls. After reading everything we could find online we were aware the hike took most around 8 hrs. We left at 8:15am planning on a 10 hr hike recognizing we would be slower than most. The climb up the waterfalls although amazing meant crossing water several times. Not wanting to fall I took off shoes and socks. (We did bring dry socks but not shoes). The way up was difficult for me at 42 with 40 lbs of extra weight. Knowing what I can handle in the gym (Crossfit) I knew I had the strength and could get through the cardio. What I didn’t anticipate was the constant drops from peak to peak and down the mountain. Having severed several ligaments in right knee and functioning bone on bone at this point with metal holding everything together it was a killer for me. Every drop I held my daughters shoulder (16) to ease the impact. Walking sticks were recommended repeatedly. No doubt my family (husband 12,16,and 18 year old) could have done the hike better without me. Great news is I finished and mentally that feels incredible. Bad news is it took 13.5 hours without a stop longer than 20 min. If you did the math we finished the hike in pitch dark. Thanks to the couple that was aware of our pace and gave us a flashlight. Our son (18) was back at the locked car hours before us. They stayed with him,gave him food,and called us several times to check on our progress. The trail is every bit as amazing as others have said but due to a knee injury I had no business up there. Our success had a lot to do with tons of hydration several days leading up to our hike. I drank 120 ounces while hiking. Hope my honest review helps someone make a safe decision preventing a hard day. Go hike…just pick the right trail for your body and enjoy God revealing himself through creation. Thanks, Tamara, for sharing! I’m sure there are a lot of people who can learn from your experience. Very helpful. Just the info we needed! My older brother took me for my first ever White Mt. backpacking trip in 1975. We came up the Old Bridle Path, overnighting the first night at the Garfield Tentsite and down in the Pemi Wilderness on night two. I remember the blackflies (early June), the blisters (boots not broken in), the merciless 0.8 mile ascent to South Twin Mt., and how remote the Bondcliffs felt. Within 2 years I had moved to New England and I have never left. I’ve done all the NH 4000 footers, but these peaks we’re my first and will always remain special to me. My son and I have been thinking of doing this hike. (age 15 & 57) We do day hikes, Mount Moosilauke,Black Mountain,Blueberry,Mount Cube and Camels Hump in Vermont.This would be the most challenging,and if we do it I plan on being at the trail head at daybreak.Also leaving the 9 1/2 year old large breed dog at home, Mount Cube at 6 miles was a push to her limits. Thanks for all the info! great info,thank you. Do you know what the mileage/time frame would be, to hike up Beaver Brook and come down the Gorge brook trail? Reminded how much I respect this wonderful area, because over Labor Day weekend, my G’son and a friend were in Greenville, and decided to climb Katahdin. Long ago memories of my years at GS trip Camp Natarswi in Millinocket came flooding back. As a relatively unathletic kid, I loved/hated some trails there–specifically Knife Edge, Cathedral , etc., but forever grateful to patient skilled counselors who got us safely through those unforgettable adventures. “It was the best of times, it was the worst of times”. . .and I’m grateful to have had it all. Didn’t expect to be experiencing it again while worrying about the G’son’s safety! Loved your funny and real comments. Thank you for such bringing back the memories, and the laughs. P. S. I know about Donn Fendler’s book. We are planning on heading to the northeast of the USA for some good hikes next year. Mount Washington is definitely one that makes the list. I drove through the White Mountains while on a road trip through New England in 2008 but now it’s time to see these beautiful states from up above! Thanks for the great post; it is very informative and certainly makes us want to get over there that much sooner now. Overall RatingFoodServiceAtmospherePrice/ValueRomanceSuitable for ChildrenWhat: Breakfast, Sweet Bread, Biscuits, Fresh Fruit, Scrambled Eggs, Bacon, Sausage, Waffles served Family styleApproximate Price of Entrees: 3 adults at $18.99, 1 child at $10.99Be Sure to Try: The sweet Bread, it is a coconut pineapple bread and is so yummyGeneral tips: We had an ADR for around 10:30am and had almost the whole restaurant to ourselves, we got great character interactionTheMouseForLess tips: We used the DDP so tax and tip were includedExtra Comments: They do a fun little parade with the kids around the restaurant. We had a blast here. Enjoyed this article. It was very good and descriptive. Thinking of taking the kids on a weekend trip through the range. Thanks for the post, son and grandson are on the mountain this weekend.Great to see were they are from my chair by the fire! Great web site you have got here.. It’s difficult to find high-quality writing like yours these days. yeah, this one really tuckered me out! the last leg of the hike to the summit is seriously intimidating while tiredly approaching it! Just attempted this loop June 2018 starting from Rattle River trailhead going clockwise. We lost the Highwater trail several times from Shelburne to the junction with Moriah Brook Trail, after which we lost it permanently. (Spent the day bushwacking, returned to camp across the river from the Wild River Campground, ended up taking the Moriah Brook Trail over the top). Rained that afternoon and all night. In the morning, even more of the Highwater Trail had been claimed by the river in new slides and lots more large trees (12 dia+) had fallen in the river. Heads up to anyone setting out for that trail – it lives up to it’s “wild”ness! Thanks for the update on the trail conditions! Awesome website with very detailed reviews of hikes and camping experiences. I am just starting out at the tender age of 54. I have done some hiking with my son’s Boy Scout troop but nothing compared to the Pemi loop which is the article on Reddit that brought me here. I am trying to get my wife to join me in this activity as one child is college bound and the other is soon behind. I was particulary interested in the hikes flagged as family hikes as I think they would be a good starting point and not get ourselves overwhelmed with the physical aspects of hiking which I think would take away from the wonders of being outdoors and enjoying the spectacular views. Do you have any recommendations for some newbies in terms of resources? I have of course already liked Northeast Hikes on Facebook. Thanks for this blog post! Very informative. I did it last year at the end of June, we doing it this coming Saturday with my granddaughter, and your description of the trail is as perfect as it can be. Will try to venture of to the Lion’s Head trail, but will take the decision when i’m on the trail. Hope the weather is friendly, because a wet trail will make it a little bit dangerous. If somebody is doing it alone, just keep following the arrows painted on the rock after the rest at the bottom of the Ravine, specially the section where the waterfall is. I heard bad stories about the well. Wouldn’t drink it even filtered. Are campfires allowed at the back country sites? Are the ledges doable with a 40lb pack strapped to you? What was other hiker traffic like? or what might we expect in early Oct? Hi Tom, I don’t remember about the fires. We went in the spring and it was so buggy that we just jumped in our tents/hammocks after eating. The ledges mentioned are on the Appalachian Trail, so they are routinely traversed by people with overnight packs. Wear proper footwear and be careful and you should be fine. Hiker traffic in the Wild River Wilderness will likely be light in October, but weather permitting, you’ll probably see a bunch of people going over the Carters and Hight. Good luck! You Sir/Madam are the enemy of confusion evherwyere! Your’s is the innelligett approach to this issue. Keep these arlcites coming as they’ve opened many new doors for me. It was great. Thinking of doing it again this fall. Done the Tucks trail twice, once after staying overnight in a Hermit Lake shelter. Took I forget how many hours up and down, but the trips was grand. On one trip, came down from the summit via the Lion’s Head trail for a change in perspective from the headwall; the other was via Boott Spur, for ditto. Going up or down, I go at two speeds: slow, and slower. to publish more about this subject, it might not be a taboo matter but typically people do not discuss such topics. Tried to climb this mountain 2 years ago. Hiked 9 hours in all and still had 2 miles to go to the summit. My girlfriend told me she was exhausted and terrified. Plan to do it myself in 2019. Baxter State Park has limits each day on how many people can enter the park. There is a campground at the base of the mountain reserve very early in high season. The park also closes in the fall. There is no treated water source in the campground and food must be bought outside the park. Clear, inmovfatire, simple. Could I send you some e-hugs? The Maine Warden Service provides invaluable guidance to Mainers and “Flatlanders” alike. Did this trail last weekend. Full on winter conditions. Sub zero temperatures at the summit with a good breeze. Crampons make the ascent and decent a bit less scary than a wet summer day. A great winter hike without the usual weekend crowds for the experienced winter hiker/climber. Highly recommended. I too am eyeing a winter ascent of the Beaver Brook. Still working on dates, but it’s good to get a report from someone who has done it recently. Thanks! Trees give peace to the souls of men who walk among them. So glad it's not just me, Anne, and the timer idea is inspired! I have forced myself to banish the internet to another computer, so that I'm not tempted to do the Amazon, Google, Twitter, Facebook malarchy, essential though those things are, when I'm trying to write! However, my iPhone has made all that much more manageable.Are you ever tempted to go back to the typewriter? I’ve only just started the 4ks and have completed 10 of them. I am super new to the winter hiking thing. I did Pierce a second time with a group. I did Willard, Arethusa Falls and Lonesome Lake on my own before completing Mt Waumbeck for #10 last week. up very fast! What web host are you the usage of? Can I get your associate link on your host? Great Information thanks so much. I am thinking of doing this with my 7 year old who is very athletic. She wants to do it. I am afraid she might get too tired or do something foolish like run ahead and get lost. Has any kids done this around that age? I don’t want to put her in any danger of course. Perhaps I should wait till she is older? however you truly make a compelling argument. Great article. I can’t wait to share it with good friends. I’d love to see an F/A18 Hornet with him being a naval aviator. But being a GA pilot myself, anything made of metal and wings is still love at first sight for me. Great session!! This is the accurate Pay-Per-Click Ad Platforms | D6 Marketing diary for anyone who wants to assay out out most this content. You observance so some its near effortful to debate with you (not that I truly would wantâ€¦HaHa). You definitely put a new spin on a topic thats been written almost for eld. Nice congest, simply enthusiastic! What a fantastic post! I require to share this with buddies. Great article, Daren. Concise and informative. I’m planning a Pemi excursion this coming summer. So far we have the third weekend in June on the books. In your experience do you think the pemi loop tail corridor is typically snow free and out of mud season by then?